I now have a number of paintings on display at Beaulieu Fine Arts, an excellent gallery with several rooms full of exciting and varied art. It’s a delightful spot to visit as you can also spend time exploring the New Forest, which is especially glorious in spring-time. The watercolour shown here is of a tranquil view of the river near Bucklers’ Hard, one of several local scenes I’ve painted. I have not neglected my wilder compositions, though, so you will find a mixture. In summer the massed greens can appear a little overwhelming, so I have introduced more grey into the further tree-clad ridges. I’ve just returned from an exciting trip to the Lebanon, returning with bagfuls of sketches. I encountered much dramatic mountain scenery, incredibly deep snow, amazing Roman ruins and not least so many kind and friendly people. And of course, the food was outstanding, and sometimes overwhelming, as when I went into an Iraqi restaurant for a lunchtime sandwich and ended up with seven courses – all at once! 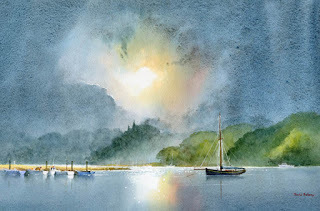 This entry was posted in atmosphere, Daniel Smith Watercolours, David Bellamy, Greens in watercolour, leaving out detail, ST Cuthberts Mill and tagged #beaulieufinearts, #danielsmithwatercolours, #saunderswaterford, #stcuthbertsmill by David Bellamy. Bookmark the permalink. Wonderful to see another of your water colours. I like the idea of softening the greens with a little smoky grey. Judith Leatham..j. Are your paintings there indefinitely until they are sold or for a limited period exhibition? The link you give to Beaulieu Fine Arts doesn’t seem to work, nor does typing their web address directly… I am asking, because it is just over 2 hours from where I now live and it would be a nice trip down memory lane, as I used to live in that area many years ago. I also look forward to seeing some of your Lebanon paintings in the future, you intrepid traveller! They should reflect quite a different atmosphere and colour palette to your Arctic landscapes! Hi Marie-France. I am sorry the links did not work. They worked when I posted the blog but I have now reinstated them and they appear to be working now. Please try again.